Truck Yeah or Hell Naw? Since the ‘76 Volvo deal fell though and my Volvo will be officially signed over to the new owner tomorrow, I’m continuing my search for a replacement. Today we have this prime example of ‘Merican practicality. 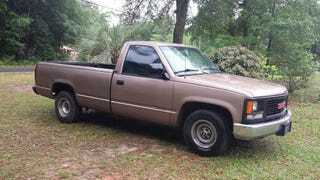 The truck in question is a 1994 GMC Sierra 1500 with the 4.3L V6 and an automatic, with only 87k miles. From my cursory reading it would seem the 4.3 is a venerable power plant and should be more than enough for anything I need it to do, while getting very ‘meh’ gas mileage. Anyone with experience have some questions I should ask? Things to look for? Price I should shoot for?